Fifteen-year-old Hannah Sheppard has a reputation at school- one which most people wouldn’t take too kindly to. She is known as the school bicycle, rumours of which she does nothing to dispel. Hannah, along with her best friend Katie, wears tiny outfits when she goes out to party in the park on Friday nights, and actively seeks out any boy who shows her the slightest bit of attention. The duo embraces the power that they have over the boys, and ignore the dirty looks that they get from the other girls in their year. Their attractiveness to the boys (even if it is more reputation-based than genuine) is their power, and they are not afraid to manipulate it. But despite her (should I say) slightly whorish ways, Hannah has another side to her that the people at school don’t see. She deeply loves her little sister Lola, spending a lot of time with her when she’s at home, she’s a little bit insecure, and she’s smarter than she lets on (although not so much academically). Aaron Tyler is the new kid at school, but he is hiding a few secrets and doesn’t want to attract attention. Unfortunately for him, the popular basketball team boys, including kingpin Tyrone, decide that he is cool enough to join their social circle, and he is immediately thrown into the spotlight he was trying to avoid. While a part of this social circle, Aaron meets Hannah and sees the other, more vulnerable side to her, finding they have more in common than he first thought. As Katie begins to drift away from Hannah to be with the more popular girls, and Aaron begins to finds himself out of favour with the basketball boys, the two newly-made outsiders begin a tentative friendship. 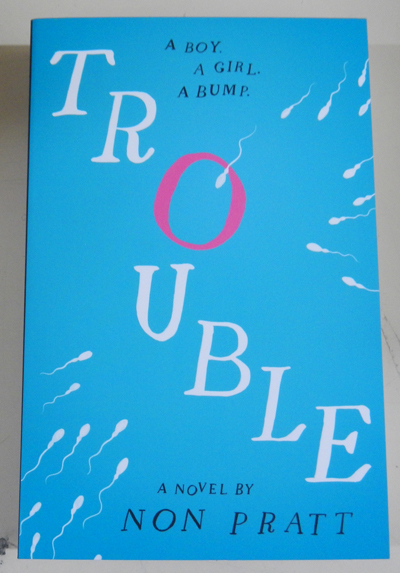 Along with Hannah’s former school friend Anj and stereotypically gay Gideon, the four teenagers tough it out amongst the school cliques, and the now obviously pregnant Hannah learns what real friendship is all about. There are a lot more elements to this novel than just teenage pregnancy and ways of dealing with guilt. The emotions covered are raw, deep and complex and sometimes it doesn’t feel as though you are reading a novel aimed at young adults. This book is split into three parts (the pregnancy trimesters) and follows the day-to-day lives of Hannah and Aaron, from their personal perspectives. Hannah is coy about who the father of her child is, and although the reader eventually finds out towards the middle of the novel, you don’t have to be especially astute to work it out before she tells you. Likewise, Aaron’s past is kept hidden until the end of the novel, but with a few hints given, the reader is able to work out some of the details, or at least an outline of what occurred in his old life. This book was both absorbing and enjoyable to read, giving an interesting insight into the lives of two English teenagers as they traverse some of the toughest moments of their lives. The characters are credible and likeable, and readers will grow to love the unusual relationship and bond that they share. If the girls' behaviour was "whorish" how would you describe the boys' behaviour?